Dana White: "Who Is Going To Pay My Income Tax In California?" Won't Someone Please Think Of Dana White? 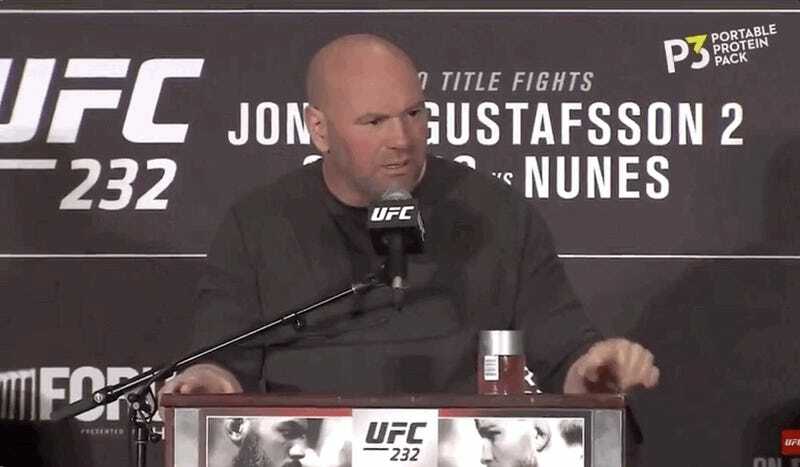 UFC president Dana White was a bit of a shithead towards a reporter on Thursday during the press conference for the recently-relocated UFC 232. To make things easier for Jon Jones to participate in the headlining fight after an “atypical” drug test, the pay-per-view event was move from Las Vegas to Los Angeles on six days’ notice. This move obviously does more than just inconvenience an audience of paying customers, it also screws over the fighters on the lower end of the night’s card, who suddenly have to factor in more taxes on their paycheck. Naturally, this issue came up on Thursday. When asked if he would help compensate fighters who have to pay higher taxes because of the move, White simply turned the question on the reporter and tried to make himself look like a victim in this scenario. I’m still not entirely sure what’s worse from White here: punishing fighters and their wallets for a decision top management made without their consent, or being so willing to drop fighters from a card if they don’t play ball with the change of plans that were forced upon them. But maybe he was just snippy because the question was money-related. Surely the president of this organization would have good answers when asked about going to such lengths to allow a fighter he said would never headline another card again to fight in a main event, right?